Giving voice to what most of us think and feel, singer and artist Chellcy Reitsma, at 42, is surely wiser than most. Born in California and now living in Malta, Chellcy’s easy smile and vibrant persona belie a passionate spirit which needs to be heard. This need for communication is perfectly expressed through her strong deep voice, which, backed by the haunting sound of the harmonica keening a sad lullaby, forms the backbone of her latest EP Black Water, released by Railway Studios last October. Containing four tracks, including the song which lends the EP its name, as well as an original poem the artist wrote herself, this EP is one of an escalating set of steps in the singer’s career, which began when she was very young. Ascribing her love to music and dance to her family’s influence, Chellcy first stared out as a visual artist and a dancer, and only later evolved as a singer, releasing Blue her first single, in 2016. A mixture of jazz and blues, Blue, gave way to her second single The Three of Us released by Beehive Studios a year later. Chellcy is currently producing and managing artistic, cultural and educational events and projects. 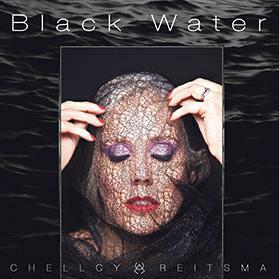 Black Water was released as a single last June and, as the singer herself describes, its main themes of personal empowerment, strength and determination pervade throughout all the tracks which make up the EP itself. Can you describe your past career as an artist? In the past I devoted my entire life to visual ars and dancing. When it comes to visual arts, I took large mural commissions both in California and in Chicago, sold my paintings and drawings to collectors and held large exhibitions at fine galleries in northern and central California and Chicago. I am still active in my artistic career, even more so now that I had to retire from dancing due to health reasons. I started focusing on dancing as a career in 2004 in Chicago and opened a dance company called Fringe Benefits directly after graduating. This focused on contemporary dance fused with Egyptian dance styles, folkloric styles, Spanish and flamenco fusions of all three genres, and Samba. I toured around Europe and North America teaching dance and choreography, and performing dances both solo and with bands at dance conferences, festivals, cultural events, and educational events. I opened a second branch of my dance company in Malta in 2008. In 2012, I closed my company in Chicago when I relocated full-time to Malta as it became too cumbersome to manage both, and in 2016, my assistant took over the dance company in Malta since I had to retire from dancing due to physical injuries. Why did you relocate to Malta? I first started coming here intermittently as of December 2005 as a dance instructor and performer. Then I decided to move here because I fell in love with Malta, and started the long migration process in 2009. In 2011 I met the man who is now my husband, who is Maltese, and whom I married in 2013. I am working on a music project with composer Tom Borg from the band Hunting Cain, as well as developing a large visual art exhibition with Finnish artist Merja Brinon, which will be showing at Spazu Kreattiv in 2019 in Malta and in 2020 in Spain and Finland. I will be travelling to Finland later in the year to work with Brinon in developing our artistic collaborations, concepts, and location scouting. The track Black Water seems to paint the image of someone looking at the past. Is there a hidden message? The EP and the song itself were inspired by my move from Chicago to Malta – letting go of the past and moving on from relationships that ended. There is a lot of sadness in these songs, but also hope and resolution. The whole EP is about moving forward, taking control of your life and overcoming your fears. Malta is known for its nightlife, not to mention the love of the Maltese for celebration and partying. Be it summer festas, weekend parties, or open-air concerts, any excuse is a worthwhile justification for making merry. The Irish feast of Saint Patrick’s, which is a cultural and religious celebration held yearly on the 17th of March, is no exception. Unlike the Irish, for whom Saint Patrick is the patron saint, the Maltese have no particular claims on this festivity as such, yet, this is not a deterrent to those of us who waste no time in donning Irish green, raising our beer glasses, and preparing ourselves for a day of inebriated merriment. This article was written by me and originally published here.